Excellent for those with moderate to severe ACL, PCL, MCL, and LCL instabilities. The Donjoy Legend Knee Brace has made a name for itself as a strong, low-profile, custom-fit knee brace. The low-profile aluminum brace makes the Legend knee brace ideal for moderate to severe ACL, PCL, MCL, and LCL instabilities and contact sports activities. It has very strong hinge bars to take whatever you give, and includes pneumatic condyle pads for greater comfort around your knee joint. The brace comes standard with a slide shield over the lateral hinge box which offers greater protection from sliding activities. The Legend by Donjoy will support your knees and support your goal to never stop participating in your favorite sport. Removable doeskin liner and pneumatic condyle pads come installed on this brace as standard equipment. Pneumatic condyle pads for added comfort and fit. Patented 4-point dynamic leverage system pioneered by Donjoy for contact/non-contact sports protection. ACL, PCL, and CI versions available. Lateral slide shield to protect and resist dirt from getting into the inside of the hinge. Non-chip Kraton coating making it safe for salt and fresh water sports activities. 7 sizes (ranging from a 13" to 32" thigh). Optional flexion/extension stop kit can be ordered to provide range of motion control if necessary. Available in three Versions: 1) ACL (pictured up top) - has additional thigh strap across front of the thigh. 2) PCL - has additional posterior calf strap for added PCL support. 3) CI Version (Combined Instability) - has both an additional thigh and calf strap added for increased multi-ligamentous support. ACL - Anterior cruciate ligament protection. PCL - Posterior cruciate ligament protection. CI - Combined instability protection (example: ACL + MCL). 1. 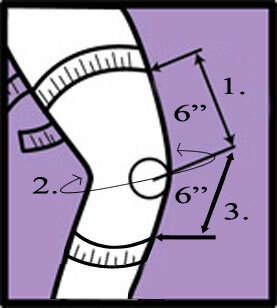 Thigh 6 inches above the middle of your kneecap. 2. Center of your knee (mid patella). 3. Calf 6 inches below the middle of your kneecap. XS 3"-15 1/2" 12"-13" 10"-12"
S 15 1/2"-18 1/2" 13"-14" 12"-14"
M 18 1/2"-21" 14"-15 14"-16"
L 21"-23 1/2" 15"-17 16"-18"
XL 23 1/2"-26 1/2" 17"-19 18"-20"
2XL 26 1/2"-29 1/2" 19"-21 20"-22"
3XL 29 1/2"-32" 21"-23 22"-24"
Aircraft aluminum brace frame design. I had an old donjoy brace and bought the Donjoy Legend brace for more support when I'm hiking with my family. I tried it out last week in the mountains and my knee didn't buckle once. Thanks. I read all of the Donjoy Legend knee brace reviews and compared this product to the SE4 and purchased the slightly nicer one. Good fit, good protection. If you have to wear braces for football - then buy it! I got hit with these on last year during our playoff game. I took a helmet to my outer knee and this brace protected my knee completely. I was able to keep playing for the entire game. This is my second pair - they typical last about a 1-2 seasons. The cost can't be beat for the protection. If you're a linemen and looking to get a pair for protection, these are really good considering the price. I purchased the Donjoy Legend for my son who plays quarterback for his high school team. He uses the suspension straps to help it stay up better on his leg because Don joys tend to slide down the leg in general from what we heard. The aluminum is very stiff to help protect his knee. If you're looking for an affordable brace, then this one is worth the cost.